Grow in sun or shade! 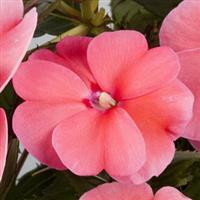 Tough to beat SunPatiens is a revolutionary hybrid Impatien. Unlike its shade-loving cousins, these remarkable plants represent a breakthrough in flower breeding: robust, sun–loving, heat–loving impatiens that thrive in full sun, part sun, or light shade (the plants typically produce more blooms in the sun) delivering continuous color from spring through frost. Whether used in boxes, patio pots or in the landscape, these beautiful plants combine massive flower power with large 2.5" self-cleaning blooms that attract hummingbirds with tough, low-maintenance foliage. 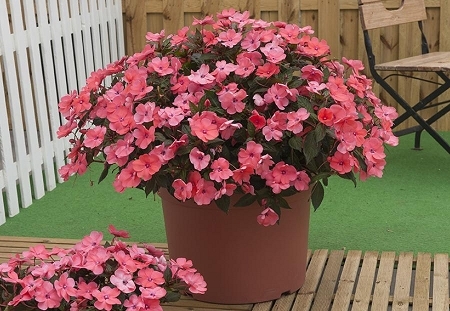 These UPRIGHT impatiens will perform through the brutal sun, high heat and humidity, wind, rain and even tolerate a light frost. Though the plants like to be watered regularly they recover quickly should you occasionally forget and unlike regular impatiens they are NOT AFFECTED by DOWNY MILDEW.